I was open to anything, but my daughter really wanted a sleepover party with her friends for her 9th birthday. At-home birthday parties are usually more work than ones hosted at a location, but they can also be a LOT CHEAPER and a lot of fun. While party favors are nice, kids rarely care if you skip the bag full of candy and disposable toys. I always try to do an activity that involves something that can be taken home after the party instead. This time, we made tie dye t-shirts. It was a lot of fun and the girls loved the shirts! We used this kit and it was easier than I thought it would be. We had a very busy month, with a lot of activities and illnesses. It was tough to cook at home and we resorted to getting some takeout food. We probably would have eaten even more takeout if I didn’t have my Instant Pot. I was able to make some quick dinners and hearty soups. Don’t know what I’m talking about? Check out my Instant Pot Review. One of my goals for 2017 was to have a monthly “kid date” so each child could have some one-on-one time with a parent. In January, we went a little wild with our kid date spending, but this month, we went for free activities. 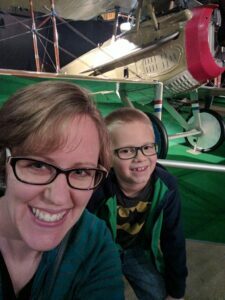 I took my son to the National Museum of the U.S. Air Force in Dayton, Ohio. It was wonderful! If you find yourself in the Midwest, I’d highly recommend a stop at this incredible FREE museum! My husband took my daughter on a kid date downtown to do some Pokemon hunting. Both of us took the kids out to eat, so the dates weren’t completely free, but they were pretty inexpensive. Airplane selfie at the USAF Museum! Unfortunately, we’ve needed a few prescription medications around here lately. Since my co-pay is the same regardless of which pharmacy I use, I have been filling our prescriptions at Giant Eagle. It’s convenient and I earn fuel perks for the amount of my copay. This helps me to save a little money on gas for my car (to get us to all those doctor’s appointments). If you don’t have a Giant Eagle near you, Kroger also offers fuel points on prescriptions. 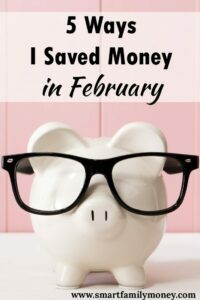 How did you save money in February? I’d love to hear in the comments below! If you want more ideas, check out other posts in this series for more money saving ideas.